Where do you draw such robust enthusiasm and tenacious joy? The ruffle that any kind of loss brings is unsettling and can remain a nagging quiz to our humanly minds and bears like no other heavy burden to our hearts. I believe only faith in God is this achievable. This last Saturday, I was privilledged to catch up with my TV. The hours we clock at work and attend to other pressing matters many a times make it almost impossible to sit infront of the TV and watch anything. We always glance as we rush about or stare at it as our brains churn unto other issues. I am grateful time availed itself to watch the TV. 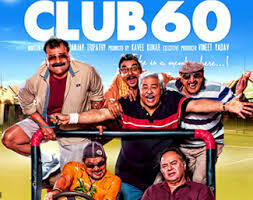 I caught up with a movie that was showing on Star Gold channel named Club 60. The movie is not your common bollywood flick with a villain and a hero. Far from it, this is an all engaging story around the losses that life brings. The story starts on a sombre note when Dr. Tariq & Saira loose their only child and son. This not only unsettles them but takes a heavy toll on the father Dr. Tariq who even attempts to take his own life. The wife Dr. Saira suggests they move from Pune to Mumbai. They move into the a flat they had bought for their son Iqbal. They are met by an overly jovial and friendly neighbor Manubhai. 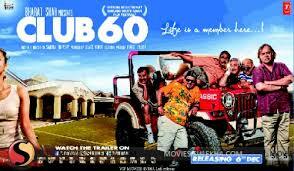 Manubhai is a very cheeky character – he is frivolous with life and goes about with full abandon. He is keen on recruiting the new couple into the Club 60. He comes out as a very nosy neighbor – he shows up unannounced – speaks his mind and heart – quick to indulge anyone and everyone in his chatter. He is oblivious to the loss the couple are coming to terms with. He is confronted by Dr. Tariq when he unexpectedly pops into their flat quite late to ask for ice cubes. Even then his enthusiasm and joy is unruffled. He comes back with their common friend from Club 60 Dhillon also grappling with a loss of his own and had called at Manu’s. He changes the mood of the couple from sombre to celebratory. In the whole movie it unravels the loss of each of the club 60 members loss behind the facade they put out for all to see. It showcases their struggle to adapt and steps towards generous living. This startles Dr. Tariq into the reality that he is not the only one who has lost – to his surprise he learns that Manu faced the flogging that life can bring and still afforded to smile and live free.